I was thinking the other week about my childhood and remembered being taken to the Circus on Clapham Common every year. I think it was Billy Smart's. It was probably triggered by watching Water for Elephants. I spent ages on Google trying to find some photographs without any success unfortunately, but whilst looking found the following of Battersea Park. They bought back more lovely memories as I recall being taken there too. 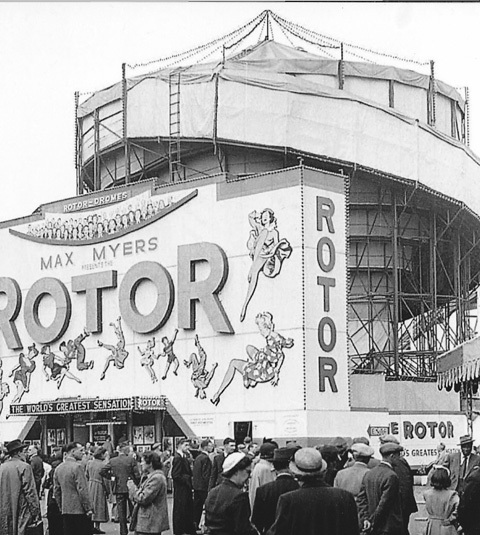 My sister tells a lovely story of the Rotor which, as it slowed down, ripped her knickers to shreds. I remember too the Grotto which was artifical caves which you walked through and the one that sticks in mind was walking over a volcano which had millions of jewels in red and orange to similate lava. 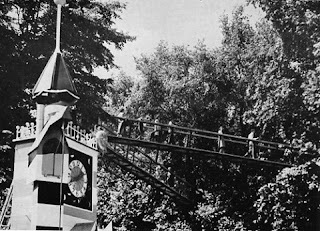 The fun fair closed following an accident with the big dipper, scary really as we had been on it the night before! 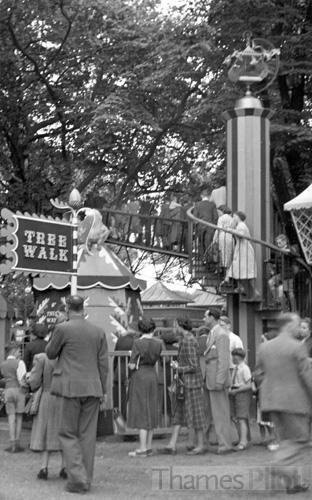 but the tree walk remained open for many more years. Along the avenue beneath the walkway were loads of candy striped tents selling popcorn. candy floss etc and some too where you could make pictures using paints on a centrifugal wheel. I am hoping to scrap these pages soon as we have the Cardinal Colours Crop in March and our annual retreat shortly after. If you remember any of these things, do share your memories, I'd love to hear them! Lovely memories, looking forward to seeing the layouts. 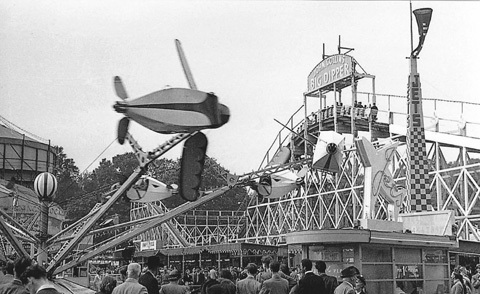 I recall that funfair at Battersea from the tree walk and the helter skelter. I asked mum and dad for years where they'd taken me with the tree walk as a kid, but they couldn't remember. Only a couple of years ago mum remembered it. If I remember rightly, the helter skelter was very tall and ended inside on a big mat somehow, but I'm willing to be corrected. Thanks for displaying the pictures though, a great trip down memory lane. There were things hidden in the trees too, weren't there ? 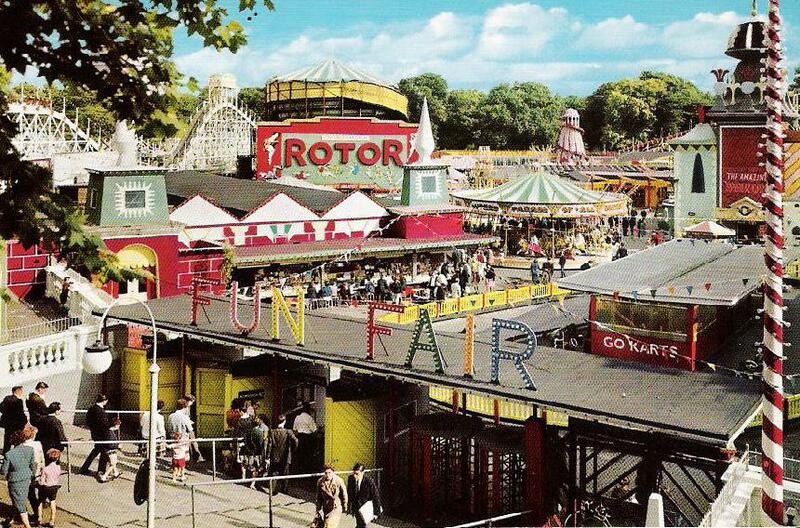 hello Linda-thank you for these amazing photos,bringing back childhood memories of the Tree Walk and Funfair in Battersea Park!I went there on a Sunday with my father when I was a little girl.I was not allowed to go into the funfair,but loved the Grotto with its perfume and fake volcano!! I came across your website by accident. I was looking for references to Battersea Park. Like you I have very fond memories of the Pleasure Gardens. 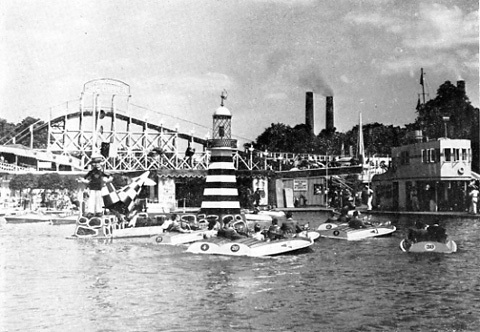 My dad used to take us there often. I think I went on every ride there and remember them so well. 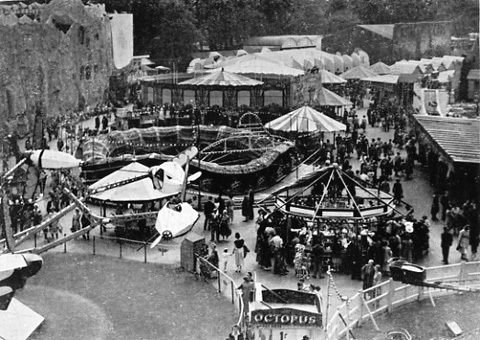 You are correct about Billy Smarts Circus on Clapham Common. They used to come once a year and we normally went. I can still see the big top in my mind - it was dark blue with orange "hoops " around the entrance. The big thing for me was seeing the lions - we seemed so close to them and only protected from them by a makeshift circular cage.